Sixteen-year-old Darrow is a Helldiver—he spends his life underground, drilling for precious substances that will allow the surface of his planet Mars to be terraformed. Life for him and the other Reds is short and brutal, but not entirely without beauty. Darrow and his wife Eo work hard because they know it's an honor to prepare the planet for all the people who will come after them. Except the terraforming is already complete, and has been for years. Darrow discovers that the Reds have been lied to and used as slaves to make a life of paradise possible for the higher color castes. Eo believes they should fight against the Golds who control them, but that decision costs her her life. With his wife dead, Darrow takes up the cause and swears to avenge Eo and free the Reds. It won't be easy. Darrow has to become a Gold, so that he can walk among them undetected and initiate the rebellion from within. Once he is transformed, he must be tested as all young Golds are tested—in a battle of wits, strength, cunning, and sheer brutality against the best the Golds have to offer. Making the comparison between Red Rising and The Hunger Games is inevitable: both center around a group of kids put into a controlled environment and ordered to assert their dominance over each other. However, as I read Red Rising, it reminded me even more strongly of a different book: Ender's Game by Orson Scott Card. Brown's main character Darrow may not be as young as Ender, but they are each savants in their way, and as a result extremely confident. They're both manipulated to a staggering degree by powerful adults who run society, and they're equally determined to defeat those who have controlled them. Both narratives spend a lot of time on how the young heroes can convince their peers to follow them and do their bidding. Along the way there are plenty of intense fight scenes—in fact, there's a lot more fighting and talking about fighting than emotion here. I would have liked to see a bit more range of feeling beyond just rage, blind rage, and all-consuming rage. It seems that when Darrow's wife dies, all his tenderness dies with her. Understandable perhaps, but it made for a flatter and less relatable central character. Minor quibbles aside, if you enjoy Red Rising, Ender's Game should be on your list as well. You can see my recommendation for it here. 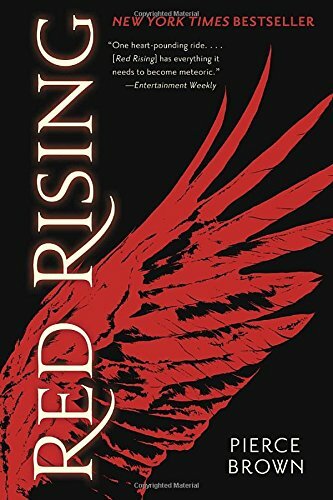 It also goes without saying that Red Rising fits in perfectly with the books on our Summer of Sci-Fi list, so if you've enjoyed the books in our Challenge so far, Red Rising is not to be missed. And finally, Brown has two more books slated for future release that will complete the Red Rising trilogy—Golden Son is scheduled for publication in 2015. TagsA Little Bit of Blood and Gore Never Hurt Anyone, Out For Revenge, Hand-to-Hand Combat [With Children], Dystopian Futures, Ethical Dilemmas, People Controlling People, Reads Like an Action Movie, Victims Taking the Power Back, YA Is For Everyone, You Think Your Childhood Was Screwed Up?